Container cover sheets protect materials from falling out of containers or skips during transportation. 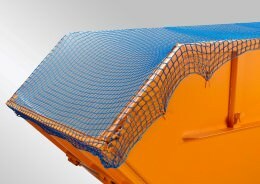 The container nets are indispensable as covering nets or cargo nets for unproblematic transportation in road traffic. The tarpaulins are available from the schutznetze24.de shop in nine different sizes, which are designed to fit the standard container models. The table below gives you an overview of which container tarpaulins fit on the corresponding container or skip. Our standard container tarpaulins are made of the extremely tear proof and weatherproof plastic polyethylene. The special feature in the manufacture of our container tarpaulins is the air permeable fabric which protects the cargo – whether refuse, rubble or organic material – from UV radiation and wet conditions, but at the same time prevents the tarpaulin from ballooning in the wind. Choose from different shade factors or thicknesses of fabric, depending on how sensitive the container cargo is. 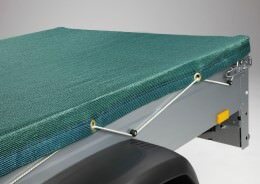 The fabric is equipped with a reinforced border and anchorage eyelets for attachment to the vehicle. You can choose between models with or without rubber tensioning ropes. You certainly can’t find this form of cargo-securing tarpaulin for containers at a DIY store! If the preset tarpaulin sizes from Safetynet365 don’t fit your container, you can ask us to produce a made-to-measure container sheet for you. In this category, you have a wide selection of weights, shade factors and materials to choose from. Our air permeable container tarpaulins are available in polyester webbing, polypropylene, polyethylene and jute fabric. 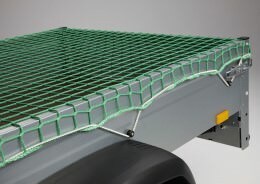 You can find fitting accessories like tensioning ropes, fasteners or lashing straps for optimising cargo stabilisation under the rubric Accessories.